Ladies and Gentlemen…. The Beatles! Universal’s Beatles 1 video collection is finally out. Yay! I’m sure some of you unnecessarily cancelled your Amazon UK orders after the mini-fiasco of last week, but as predicted by yours truly, there was never any issue in the first place. Oh well. But I’ve love to hear what everybody thinks about the new sets. I’ll be honest, I don’t have the physical product yet (I know..) although I’ve had some promo discs for a while. The plan was to create an SDEtv video to show off ALL the different formats. Universal had agreed to send SDE EVERY edition of 1, but unfortunately the stock hadn’t arrived yesterday, so will hope to do this video for you early next week. Read more about The Beatles 1 video collection here. Of course Bob Dylan‘s The Cutting Edge Bootleg Series Vol 12 was also released yesterday. Some of you who’ve ordered the expensive 18CD version have been in touch to say that you aren’t getting your sets until 20 November, despite promises of day-of-release delivery. That’s pretty disappointing. If you are paying a premium, then you rightly expect a premium service. 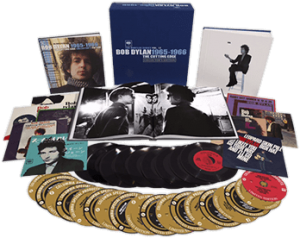 Apparently the Dylan team seem surprised that a limited edition of 5000 sold a lot of copies pre-release. Oh well, at least you can listen to your high res audio over the weekend… wrong! You won’t get that until Monday 9th. Not everyone has been affected, but these emails were sent out yesterday, the day of release, to those that have been. Read more about The Cutting Edge here. 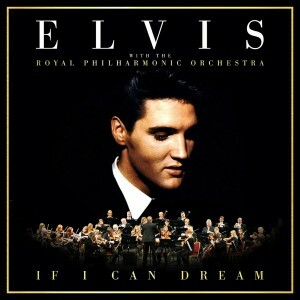 Impressive performance from RCA/Legacy Recordings Elvis set If I Can Dream which debuts at the top of the UK album charts. I will admit to not having heard this ‘reimagining’ which sets Elvis vocals to the Royal Philharmonic Orchestra, although it doesn’t really appeal to me personally. There is even a duet with Michael Bublé on Fever. I have to say, if you asked me where I stand on Michael Bublé the answer would be “his windpipe” (apologies to Steve Coogan). Elvis’ gain (he’s now had no. 1 albums in five different decades) is Rod Stewart‘s loss. His 29th studio album Another Country fails to match the achievement of 2013’s Time and doesn’t enter at no.1. Rod has to make do with the number two position. 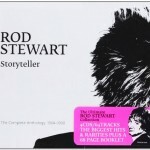 A little consolation is that one of my favourite Rod archival releases, the 4CD Storyteller collection re-enters the physical chart at number 17, no doubt due to some in-store promotion I’m unaware of. 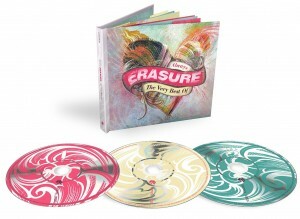 Everyone loves a greatest hits and Erasure‘s Always – The Very Best Of enters the physical chart at no. 4 and just squeezes into the top ten of the combined chart with a number nine placing. The generously priced, remix-heavy three-CD set no doubt helped with this success. 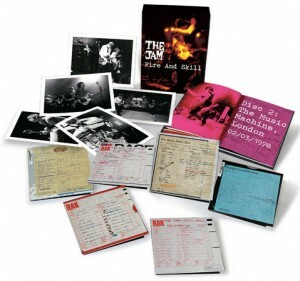 The new Jam box set, the six-CD live anthology Fire and Skill stops just short of the top 50 at no. 51 after a week in the ‘shops’ but that’s decent enough for a set that was over £60. Even the limited edition vinyl Live at Newcastle City Hall 1980 enters at no. 71 on physical sales and that is only available from Universal’s Udiscover store. Would love to know actual sales numbers for this (a few hundred?) but that’s not available, since the Official Chart Company treat that as client-confidential information, unless the client (i.e. the label) wants to reveal it. Alanis Morissette‘s Jagged Little Pill is hiding at the back of the class, lurking at number 78 on sales. Pretty disappointing for such a big selling album, although I don’t know about you but it feels rather under-promoted, even if Alanis and producer Glen Ballard have sat down to create a ‘spotify landmark edition’ (“the real story of Jagged Little Pill“) to celebrate the reissue. This is definitely worth a listen. 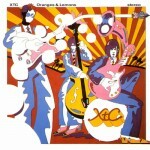 XTC‘s Oranges and Lemons was always a niche reissue but still sneaks into top 100 on physical sales, although Wet Wet Wet‘s Picture This set always sounded like a mis-step and this has possibly being confirmed by a woeful placing as the 100th best selling music release last week. Should’ve reissued the one everyone wants, Popped In Souled Out! Bought it in HMV the other day. It was three quid cheaper than the tax dodgers, too. On my vinyl purchases I tend to buy at local shops but on cds and cd box sets I use Amazon US. I seldom have had any problems and the delivery has been spot on. I ordered the 6 disc Dylan set along with the vinyl version and they both arrived the day of release. From time to time I order from Amazon UK and those packages arrive within’ a week or two at most. I do this because at times the Amazon UK price is much cheaper than the Amazon US or I can’t find the release at all on Amazon US. But overall Im happy with it. I’ve been following the thread about it at Quadraphonicquad and it seems like the music is all in the fronts and the rears merely have ambiance, or duplicated content from the fronts. Having heard the amazing 5.1 mixes on “Love”, “Anthology” and “Yellow Submarine”, I find this very sad :-( No-buy from me. Even if the 5.1 isn’t quite as you might like it that’s only one piece of the jigsaw. The main selling point is fantastic cleaned up visuals. The stereo mixes and 5.1 are a nice bonus. I would have thought most reasonably passionate Beatles fan would be jumping at the chance to own pristine versions of 27 or 50 videos!? The Jeff Lynne produced tracks were also remixed. A friend of mine interbreed him recently and it was confirmed. What is your source for the claim about HMV? Visited Wolverhampton and Birmingham HMV stores yesterday was told the copies they’d had were the only copies they were getting in both stores and this would apply across the country, but I should try and order online. Does anyone know how many copies of the 1+ DVD and Blu ray have been made? Been so used to items being ‘limited editions’ only to find loads of copies in stores 12 months later. This does appear to be limited. Thanks for the info re: HMV. Interbreed – that’s a pretty bad typo! No, he didn’t ask him. It was a promotional thing for the new JL/ELO album, so not much room for Beatles stuff. The big surprise was the new remixes of Free as a bird and Real Love which doesn’t seem to have been mentioned in the pre-release material. Jeff Lynne has either been given access to better quality tapes of John or todays technology has allowed them to improve them, but I’m hoping these tracks get a cd release. What are other readers opinions on the set? I too, herein Oz, am growing weary of Amazon UK. Usually the P&P is cheaper than BS etc, but with the prices going up it can now turn out to be more expensive. With the higher Amazon prices, our local big chain here – JBHifi – tend to now have equivalent (or close enough) prices , and there’s no risk of overlong delays and in-transit damages. I hear you Steven but these days JB HI-FI seem to be limiting what they put on their shelves with special edition CDs. Often I have no choice but to go through Amazon UK. Same goes for DVD and Blu Ray. If you are referring to a vinyl version, there is one planned for release on 4 December. Amazon originally posted it with a price of £54.99 (when I first saw it). It then reduced to £46.99, now it’s £31.99. It may well come down further to between £25 and £30. I think you are right. There may well be a full set / near full set of new Remixed Stereo (and 5.1?) versions on CD, Vinyl, BD and DVD in the near future!? Actually despite all the criticism of Amazon the copy of the Jam boxset I ordered from them (that I got at £52) was delivered to my door at 9.30pm the Wednesday before the Friday release. That was impressive. I bought my “1+” CD/2DVD in Fopp, which has been an offshoot of HMV since about 2007. Amazon’s delivery service is creating problems – I’ve had them give parcels to a neighbour that would have easily fitted through my letterbox. I live in a block of flats and was advised that giving my stuff to a total stranger is “safer” that putting it through my own door!! I only really use the marketplace now because at least, that way, my things will be at the local Royal Mail depot 10-15 minutes walk away rather than languishing in a warehouse on a totally inaccessible industrial estate. I’m a bit annoyed with myself for buying “1+” in a way as it encourages the wrong type of behaviour. The CD/DVD is £13. The CD/2DVD is £33. There is no way this represents value and it says everything about how desperate the music industry has become to price-gouge their last remaining customers that the only format they *didn’t* make of this thing was a 2DVD or 2Bluray set with all 50 videos – instead, I also had to pay for a CD I consider unnecessary (and is clearly a stalking horse for a full set of remixed albums) and a mildly diverting but inessential book inconveniently glued inside the package. It is no coincidence that the only missing format is the one that everyone I’ve asked about it actually wanted. Remixes schmemixes. I am in Prime and using the no rush for credits. For instance I got the Dylan yesterday and the Beatles is arriving today. To go against the grain on all this though, I have had no problems with Amazon UK at all and the packaging is always fine. I do use HMV as well in Leeds which is an excellent shop and bought three Springsteen CDs just there last week at a cheap price. Staff are great there as well. I tend to use shops for impulse buys. Which Amazon everyone is talking about here? “.com” or co.uk”? I stopped using American Amazon some time ago because no matter how many times I comment on their lax packaging (those soft yellow envelopes are so non-protective its a miracle the item isn’t wrecked beyond recognition) they NEVER do anything about it but Amazon UK always package every item in hard cardboard, much like Book Depository (and their books are always pristine on arrival). Its not foolproof (the recent Frida/Something’s Going On reissue had a noticeable but not too bad crease on the spine) but in the majority of cases I never have a problem. No Michelle, just the 2 disc CD/DVD edition unfortunately. From everything I’ve read the boxset version sold very quickly. Shame it was a limited run. I would’ve snapped it up. The Rod Stewart collection was part of a 2cd for £9 offer in Asda last week. Not bad, 4 discs for effectively £4.50. On the Amazon topic. What a waste of money prime subscription seems to be. My Beatles 1 set arrived yesterday, day after release using the free super saver delivery which is supposed to take 4-5 days. I’ve started occasionally using the ‘not in a rush’ option on Amazon Prime. You normally get a £1 credit for movies, apps etc. This can add up quite quickly so at the weekend via the Fire TV Stick you can rent some new release movie for free effectively. So Badlands, Burning Shed, Real World, Spin will be getting more of a look in from me from now on where they are competitive. Amazon have given great service over the years but appear to be taking customers for granted as well as exhibiting some strange business and legal practices more and more these days. Competition is a good thing and the more people that support the smaller businesses ensures that competition will hang around that bit longer. Yes amazon are becoming less and less appetising to use. John really would like to hear what problems you have had with Amazon. This is my third problem on the trot. I pre-ordered T’Pau. Wednesday in the early hours of the morning it said “preparing TO dispatch. Thursday it went “preparing FOR dispatch”. Then it just sat there. Saturday did an online chat. My opening line was “I am not impatient but….”. The reply back rather alarming. She wanted me to CANCEL my order, and re-order it again, that way I would get it quicker!! She went away and came back and said the parcel was in “advanced shipping process” (does anyone know what that means and could enlighten me). My final parting comment was “if there was no movement in progress by midday, I would cancel my order and get it from HMV.”. 9.30 my email pinged, Amazon had given me a £5 promotional credit. I did think that was nice, I was not after anything from them apart from my parcel. 10.30 just before leaving to go shopping I refreshed “my orders”. I never seen this before on free delivery “Shipping, and delivery by Sunday 8 November by 1pm”. I had an email at 6.30 that evening saying dispatched, but it was being delivered by DPD. It does make you wonder what the Amazon help person saw on their screen. Before you ask I ordered from Amazon in the past, for one main reason, my nearest HMV is over 60+ miles away. A trek. Amazon correctly sent the 1cd and 2blu-ray package but their silly packaging meant the spine has a crease in it. I’ll probably sent it back and request another un-squashed delivery. 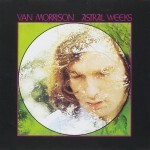 Bought both Van reissues in HMV today. £5.99 each, same as Amazon. I find their prices pretty similar these days for bpth new release and back catalogue. Oh Amazon…how you have turned so many against you. I stopped buying about 3 years ago when a dozen purchases in a row were all incorrect. Every time I ordered the new remastered deluxe edition I got the old original. So aggravating. They damaged 3 Clash Boom Boxes one Christmas. Wife got a clean one in February. Just horrible! Cancelled the Prime as soon as the rate went up. The really crap thing is that in the U.S. the buying choices at reasonable prices for UK imports is so bloody limited. Would love to buy direct from Edsel but they won’t allow shipments to the U.S. My wants list just grows until I can find a good well priced source. I too have been moving away from using Amazon, unless necessary. Started with the increased free shipping threshold, how long things were taking to arrive (new releases not arriving til Thursday with Super Saver) and the increase in prices to HMV levels, but the real killer has been the Friday release date – it’s not much of a hardship to just wait and pop into town at the weekend if things only come out on Friday! 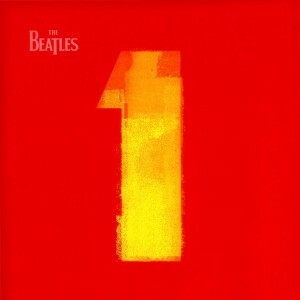 FYI: I uploaded the album artwork for all seven versions of The Beatles “1/1+” to AlbumArtExchange.com. Didn’t I read that Amazon have lost physical release market share this week? Think so…. Clearly there is some momentum gaining against using them now for several reasons, not all being the actual experience of using them as Charles points out – the new P&P charges and the sneaky Prime service has not helped IMO (as well as the ludicrous fluctuating prices). I am guilty of using them too much in the past, and will now try to use HMV too. Shame HMV’s online store is such a lightweight affair at the moment. Going to the high street store is ok, but local (Peterborough) parking and traffic flow is a real put off for doing that. Ironic for me given that Amazon have one of their big warehouses in Peterborough. I used to impulse buy on Amazon all the time. The minimum £20 spend has put paid to that. I still use Marketplace though when looking for a good deal. I should get myself down to HMV and have a look. I agree with Daran, the HMV web-site needs a lot of improvement. It’s nothing like it was in the days when I would regularly purchase from it. Amazon’s price policy reminds me of the Stagecoach bus company, who fought price wars with long established small local bus companies, their deeper pockets allowing them to win out in the war of attrition. When the local companies inevitably folded, they pushed up their prices. In Amazon’s case, for local bus co.’s, read; local record and book shops. They’ve now wiped out the opposition, so watch those prices rise. In theory, one of the benefits of Capitalism was supposed to be competition; in practice, however, it seems to be about wiping out competitors and establishing monopolies. Then there’s Amazon’s tax-avoidance; they don’t even contribute towards the infrastructure they so happily take advantage of. What Charles said! He`s right! Totally Agree! I agree with whats has also been said, i now avoid amazon , i used to use local, amazon and sainsburys for physical cd`s now, it`s all local. I totally agree with you regards Amazon. If their prices had gone up because they were now paying UK tax, they could be partially forgiven, IMO. I think you could’ve found a better analogy than Stagecoach. Most of the local bus companies they shunted aside were pretty rubbish, even the poorly run local authority ones (of which there were many). As a I work in the public sector (transport) my default position would be to support public sector providers but as a company I find Stagecoach a very easy company to work with. Because of their roots, they have a good grasp on the realities of modern levels of demand. As people (in general) have stated their preference for private transport (the car) it’s incredibly difficult to justify huge amounts of money subsidising (often little used) bus services. Stagecoach run very efficient bus services wherever they are. The only equal/better operators are in places where there is a significant market (e.g. Brighton & Hove). Got my Dylan set two days ago (U.S.). A little surprised that they didn’t have the downloads ready yet, since you’d think that part would be easy. Supposedly they’re coming Monday. Not a big deal for me since it’s probably going to take a couple of months to listen to the whole thing. I can only hope that the postman didn’t hurt his back delivering this monster. Problems with Amazon UK in recent weeks has led me to visit my only local record shop more (HMV) and because their prices have been the same as Amazons recently I will no longer be pre-ordering from Amazon. HMV also have a reward system in place along with competitive prices now so while Amazon are gradually alienating people (minimum spends for free delivery going up, poor packaging, big price drops a week after release date, pushing Prime) it seems HMV are working to get custom back. HMV and Burning Shed will be places I visit before Amazon from now on as the benefits Amazon used to have are gradually being eroded.